As he extended his hand in a corridor of the Portstewart clubhouse, our meeting got off to a rather fraught start. "You had my score wrong," chided Peter Alliss, in a reference to a piece I had written about the 1951 Open Championship. "It was 69 not 79." Anxious to talk further with this remarkably enduring icon of the game, I held my counsel. Maureen Madill too maintained a diplomatic silence when we eased our way into a corner of the upstairs restaurant. Then, having dispensed with his gripe about events of 66 years ago, the great man was ready to talk. Madill is the club's most celebrated member and latterly, her work with Alliss for BBC television has been a feature of golf broadcasting. So chatting to the pair seemed like a perfect way of celebrating the first staging of the Irish Open at Portstewart. 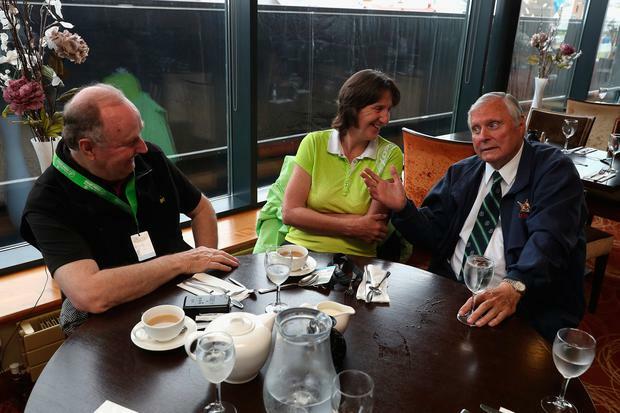 For his part, Alliss had made the trip as a gesture to his son, Simon, who was celebrating his baptism as championship director of the Irish Open. "I protested some months ago that I didn't feel up to it," said dad. "But he came back to me more recently and insisted 'I'd very much like you to come - you'd be doing me a favour'. That's when I realised it was a big thing for him. So I said that if they didn't mind me shuffling about like a cantankerous old bugger, abusing the invalid loo, I'd come. To support my son." At 86, Alliss walks unsteadily with the aid of a stick, but the distinctive voice and eloquent delivery have defied the passing years. And the sense of mischief inherited from his golfing father, Percy, is also undiminished. "Another reason for being here is to acknowledge the effort which has gone into this tournament," he continued. "It would be very easy to say that I want to support Dubai Duty Free and all that, but the truth is that I've always enjoyed Irish golf and your enthusiasm for the game. I remember coming here in 1961 and I've been making visits North and south ever since. Along the way, I've found myself lamenting the Troubles as a particularly sad chapter of Irish history." His finest competitive year was 1958 when, after regaining the Spanish Open title he had captured two years previously, he added the Italian and Portuguese Open crowns for good measure. But he is best remembered here by my generation for the 36-hole score of 127 he recorded in the Irish Hospitals Tournament at Woodbrook in 1961. "I was considered to have had one of the best swings of my time, and putting is, I believe, the main reason I never won an Open Championship," he went on. "Towards the end of the '60s, I began to twitch on the short putts and I retired from international matches at the end of the 1969 Ryder Cup. "I made great friendships here with people like (Christy) O'Connor, Mary his wife, Philomena Garvey, Joe Carr with his endless John Player cigarettes, and all sorts of players. "As a wonderful character who had played Augusta, Joe had me imagining myself working in an estate agents in a nice area where they turn over houses every three or four years and where there would be nice golf courses. And I'd have a very sympathetic boss who would let me play and I'd be good enough to win a few bits and pieces. That was me, around 1960. "My earliest memory of Christy was that he seemed to appear out of nowhere at the age of 28 or 29 and was attached to Bundoran. He was looked upon as the wunderkind of the day, this fellow from the west coast of Ireland with the most natural swing. He was going to set the world on fire. And he did, of course." At which point I reminded him of how he had reported for the Daily Express on the famous victory by O'Connor and Harry Bradshaw in the Canada Cup at Mexico City in 1958. "The elevation was 10,000 feet and Bradshaw had the worst varicose veins and flat feet of anyone I've ever seen in my life," he recalled. "It was 100 degrees. At the time, it was one of the greatest golfing feats ever, and I was essentially giving my opinion to the Express, as my father had done for the Sunday Express on the Ryder in 1930-something. "They were strange times. 'The Brad' was 5ft 9 or 10, overweight a bit and walked bump, bump, bump and told stories about Americans at Portmarnock and doing three rounds in the one day, pulling his trolley. Playing them for £50 and skinning them with ease because they didn't think Harry could play, with the grip he had [three fingers overlapping]. "I suppose he would be considered a little eccentric these days. We don't have any Harry Bradshaws any more. He played at a time where there were several eccentrics on the circuit. "If I'm not mistaken, Harry went one-and-a-half if not two tournaments missing maybe one fairway. And I think he went for an entire season without missing a green with anything higher than a seven-iron. From 120 yards he never missed a green, and I look at them today missing greens with wedges. "This isn't just a stupid old man talking, but I'm sure the players were more skilful in my day and more skilful still from 1900 to 1930, when you look at the equipment, the balls and clubs they used. They were geniuses. "Today, they're looking at yardages. Like it's 99 yards. What am I going to do? I've got a club that can do 96 or 104. I'm buggered now. I can't play. So why can't you just take a bit . . ."
It may be appropriate at this stage to clear up his slight on my numeracy. A story from the 1951 Open Championship at neighbouring Royal Portrush concerned Alliss as a 20-year-old shooting a brilliant opening round of 69 and then celebrating by going out on the town in the company of a winsome local lassie he remembers as Doreen. Which was supposed to have led to a second-round 84 and a missed cut. In fact, the 69 was shot in qualifying and his two rounds in the Open proper were 79 and 80. Which reminds me of the famous line from the movie The Man Who Shot Liberty Valance advising us that "when fact becomes legend, print the legend". Meanwhile, when I was getting into my stride at golf writing nearly 40 years ago, Madill was putting Portstewart on the map as a gifted player. "I believe I was the first female along with a Welsh girl to go to the US on a golf scholarship," she said. "I had done a year at St Andrew's University and was still 18 when I went to Texas. Of course there was no such thing as emails or texts in those days. You got a phone call only if somebody died. "Our family had an association with Peter Alliss even before he was aware of it. Patricia, my older sister, went to Edinburgh University, and Mum wrote to Peter asking if he could recommend a good coach in the Edinburgh area. And as I was to discover later on, Peter replied to every letter he ever got. "He replied to Mum telling her that there was one fellow worth checking out. And that was John Shade, father of RDBM [Ronnie] Shade. So Patricia started having lessons with JS, as we called him. They hit it off. Then, on my first trip away as a 15-year-old, I went to my big sister in Edinburgh where I too started getting lessons from John Shade. "I credit him with taking me to the level which allowed me win the British Matchplay title in '79. He was a great, great guy. Sadly he died two months before I won it. "Thirteen months later, I won the British Strokeplay. But I never won an Irish, which was a bit of a disappointment, especially losing two finals. The second of those was particularly painful, given that it was against Mary McKenna at Portrush, where I was two up playing the 13th." Recalling her decision to turn professional in 1986 prompted Alliss to interject: "I was the first president of the Ladies' European Tour and with 28 or 29 tournaments a year, I felt convinced it had a great future, given the commercial possibilities of the things that women use, like cosmetics, perfumes and clothing. I was sure there would be companies waiting in line to sponsor tournaments. But sadly it didn't happen." He closed by speaking of the Irish Open tournament host, Rory McIlroy, who was about to make an unscheduled departure on Friday afternoon. "Rory has travelled an enormous distance in the 10 years I've been observing him," he said. "It must be his background, his schooling, the people he met at school and the efforts his mum and dad put in. "Whatever the reasons, his connections here are genuine and robust and he has tried to become part of Irish golf." With that, it was time to go. I had imposed enough strain on those mellifluous chords which have enriched so many lives for so long. Not least around these parts.